In addition to beaches, parks and rooftop bars, you’ll find locals at these classic outdoor events all summer long and hopefully soak up some cultural enrichment too. A beloved New York summer rite of passage, Shakespeare performances actually pop up with frequency downtown. But the big event takes place at the beautiful Delacorte Theater in Central Park. This year, Public Theater gives us Othello in May and June, and a musical adaptation of Twelfth Night in July and August. Chukwudi Iwuji, from London’s Royal Shakespeare Company will play Othello opposite Corey Stoll, a New Yorker known for roles in The Strain and House of Cards, as Iago. Free tickets are distributed each day at noon at the theater. Click here for the calendar and don’t forget you can also make a donation to experience Shakespeare in the Park without the wait. As the temperature rises, salsa and dance block parties spring up like geysers, and in June and July, Lincoln Center puts on the best dance parties of all. Over the course of three weeks live bands play swing, salsa, big band and ballroom in the plaza at Damrosch Park starting around dusk. Click here for your favorite dance night starting the last week of June. Tickets sell out quickly but plenty of bystanders gather outside the main floor to listen and dance too. Here is an excellent reason to take a ferry to Governors Island. 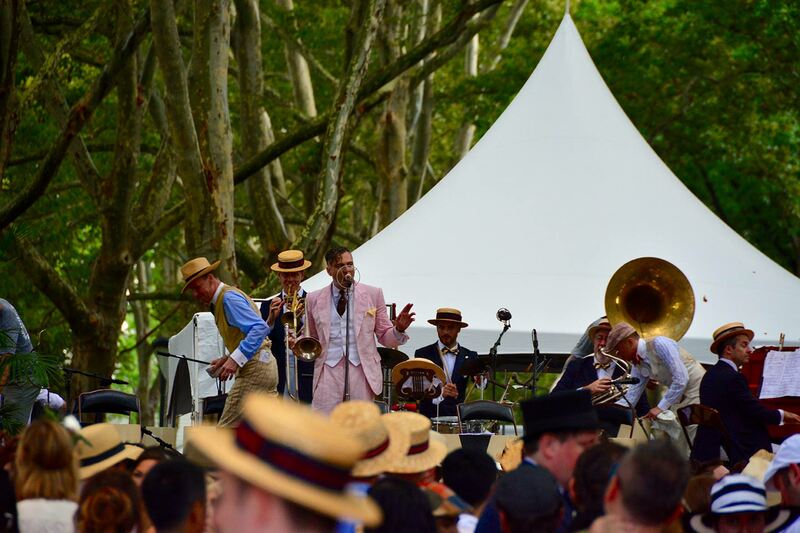 Don your best period threads and travel back in time to this roaring ’20s party for a day of Jazz-age orchestras, dance lessons and contests, cocktails from Julie Reiner’s Clover Club, pie eating, epoch shopping, and the best people-watching all around. Pick from two weekends—June 16-17 and the last weekend of August—and buy your tickets here now. For Manhattanites, this block party in Madison Square Park is where all the action is. A single ticket gives you access to the best barbecue across the city as well as around the country, with names like Blue Smoke, Hometown BBQ, and out-of-towners Memphis Barbecue Co., serving up their smoky best. Tickets are available here, and don’t forget to arrive early. This event basically kicks off summer. Pop stars, rap artists, indie rock bands, classical musicians, and acts crossing nearly every musical genre will perform more than 100 shows across the five boroughs thanks to the City Parks Foundation’s series of outdoor concerts. Click here to find shows in Central Park, like a symphonic tribute to David Bowie, Portuguese folk singer Mariza, and recitals by the Metropolitan Opera, from June until the end of August. You go for the music but also for the neighborly NYC vibe. The Knickerbocker, located in the heart of Midtown at the corner of 42nd Street and Broadway, is a cultural hub of its own. Don’t miss stopping by St. Cloud Social, our rooftop atop Times Square, for sweeping views, classic cocktails and frequent live entertainment. And theater-lovers will find Broadway’s biggest shows just beyond our doorsteps. Check out our recent reviews of shows we’ve personally vetted, from Disney blockbusters like Frozen and Lion King to star-studded revivals like Once on This Island and Angels in America.